Did self-replicating robot bird beings lay an egg that founded the civilization of ancient Egypt? ANCIENT ALIENS recently interviewed me about the possibility that alien robotic probes were sent to earth in ancient times. At first, the question seemed a bit out there. But then, my show research returned me to my 2006 book, “Starwalkers and the Dimension of the Blessed,” in which I decoded the ancient Egyptian Edfu Creation Texts and compared them to the story of Atlantis. This incredible text tells of a tribe of bird-like beings of light who came to earth and laid an egg that become an original island civilization. In Starwalkers, I proposed that this story was the source material for Plato’s story of Altantis, the island civilization that was destroyed by cataclysm c. 9,000 B.C. National Geographic followed me to the temple of Horus at Edfu, Egypt where the texts were written, to investigate this story. Revisiting my work on the Edfu texts in 2016, I was shocked and excited to discover how the Edfu story perfectly matches with the concept of self-replicating, artificially intelligent robot seeder ships presently being proposed as a way to explore and colonize the galaxy. Are the Edfu Texts, and tale of the star seeding of the earth by the Bird Tribe, actually the story of an ancient A.I. probe or genesis device? As I show below, I think we have to seriously consider the possibility. My thought stream concerning the possibility of ancient alien robotic probes began flowing with this comment from futurist and science writer George Dvorsky (http://www.sentientdevelopments.com/2008/03/seven-ways-to-control-galaxy-with-self.html). And then there this from Wikipedia, noting that back in late 1940’s the Hungarian mathematician John Von Neumann wondered if it might be possible to design a non-biological system that could replicate itself in a cellular automata environment. Von Neumann rigorously studied the concept of self-replicating machines that he called “Universal Assemblers” and which are often referred to as “von Neumann machines”. While von Neumann never applied his work to the idea of spacecraft, theoreticians like Freeman Dyson, Eric Drexler, Ralph Merkle, and Robert Freitas later took his idea and applied it to exactly that. In Von Neumann’s thinking if a self-replicating probe finds evidence of primitive life (or a primitive, low level culture) it might be programmed to lie dormant, silently observe, attempt to make contact (this variant is known as a Bracewell probe), or even interfere with or guide the evolution of life in some way. Physicist Paul Davies of Arizona State University has even raised the possibility of a probe resting on our own Moon, having arrived at some point in Earth’s ancient prehistory and remained to monitor Earth. which is very reminiscent of Arthur C. Clarke’s The Sentinel. A variant idea on the interstellar von Neumann probe idea is that of the “Astrochicken”, proposed by Freeman Dyson. Astrochicken, Dyson explained, would be a one-kilogram spacecraft unlike any before it. It would be a creation of the intersection of biology, artificial intelligence and modern microelectronics—a blend of organic and electronic components. While it has the common traits of self-replication, exploration, and communication with its “home base”, Dyson conceived the Astrochicken to explore and operate within our own planetary system, and not explore interstellar space. Astrochicken would be launched by a conventional spacecraft into space, like an egg being laid into space. Astrochicken would then hatch and start growing a solar-energy collector. The solar collector would feed an ion drive engine that would power the craft. Once Astrochicken entered a planet’s vicinity, it would collect material from the moons and rings of the planet, taking in nutrients. Oxford-based philosopher Nick Bostrom discusses the idea that future powerful superintelligences will create efficient cost-effective space travel and interstellar Von Neumann probes. He believes there is a strong possibility that we are living in a computer simulation. Yet another variant on the idea of the self-replicating starship (or cosmic egg ship) is that of the seeder ship. Such starships or “space birds” might store the genetic patterns of lifeforms from their home world, perhaps even of the species which created it. Upon finding a habitable exoplanet, or even one that might be terraformed, it would try to replicate such lifeforms — either from stored embryos or from stored information using molecular nanotechnology to build zygotes with varying genetic information from local raw materials. Such birds might be terraforming vessels, preparing colony worlds or “nests” for later colonization by other vessels, or — should they be programmed to recreate, raise, and educate individuals of the species that created it — self-replicating colonizers themselves. Seeder ships would be a suitable alternative to Generation ships as a way to colonize worlds too distant to travel to in one lifetime. With these thoughts of alien cosmic eggs as artificially intelligent seeder ships in mind, let us take a trip to Edfu, Egypt and examine the Edfu Texts written in stone on the walls of the Temple of Horus, the Sun-god, at Edfu around 250 B.C, but whose sources are much older. The walls of this temple feature the story of the arrival of sages from the stars who star seeded a civilization beside a Field of Reeds. The following is an excerpt from my book, “Starwalkers and the Dimension of the Blessed”. I have annotated it here to include my thoughts on the possibility that it describes an ancient alien artificially intelligent probe. “On the ancient stone walls of the Temple of Horus at Edfu are inscribed some of the most astounding texts one will encounter anywhere. These texts describe this temple as the work of the gods themselves and an entity of mythical nature. Here we read about the origin of a primeval resting-place of the Falcon and life in a primeval domain of the Falcon. These texts relate a tradition that says the spot of creation – the Island of Creation — was a field of reeds where divine beings resembling falcons came to Earth. The current temple of Edfu was founded during the reign of Ptolomy III in 237 BC and was completed in 57 BC; meaning it was in like new condition at the time of Jesus. According to legends etched onto this book in stone, it replaced an older structure designed in accordance with a divine plan that ‘dropped down from heaven to Earth’. This first temple came into existence at the beginning of the world. It is highly probable that the texts etched upon these walls are far more ancient origin than the Edfu Temple upon which they are ‘printed’. The Edfu Texts, as they are known, are largely unknown and were only recently translated. This does not mean their contents are unfamiliar. As we will see the Edfu Texts tell a tale that is hauntingly familiar. Dr. E.A.E (Eve) Reymond is the primary source of information on the Edfu Texts. Writing in The Mythical Origin of the Egyptian Temple, the Manchester University Egyptologist says these mysterious texts contain cosmological records that begin with a picture of a primeval island where the gods or divine beings were believed to have lived first. These records, says Reymond, are of divine origin and are the words of Sages. 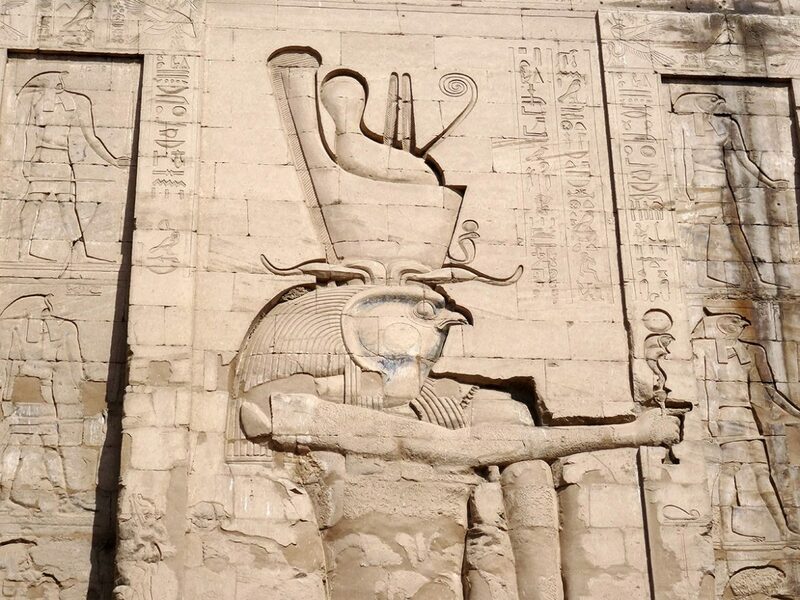 On the north wall of the inner face of the Temple Enclosure the Sage of Sages, Thoth, the ibis bird-headed neter of divine magic, is depicted offering a sacred book to Horus, the falcon-headed blue bird. Thoth is credited with possessing an entire library of books, 36,500 of them, which he housed in a repository called the Hall of Records. Among the titles included in the Edfu collection are the Specification of the Mounds of the Early Primeval Age (accredited to Thoth), the Sacred Book of the Early Primeval Age of the Gods and Offering of the Lotus. The mythological and cosmological picture these creation texts paint is complex. Dr. Reymond’s scholarship is detailed. In my book, “Starwalkers and the Dimension of the Blessed”, I outlined its features. According to Egyptian cosmology, all began with the emergence of a sacred island out of the primeval waters of Nun. The Egyptians said a mound emerged from these primordial waters and became the resting place of the creator of the world. It is also thought of as the nucleus, the egg, from which all creation on Earth grew. A lotus emitted radiance from this place. The Island of the Egg, as it was called, was surrounded by the primaeval water. The Edfu Texts tell us by the edge of this lake was a ‘Field of Reeds’ (Aaru), a sacred domain also named Wetjeset-Neter (‘the Homeland’). Throughout the Edfu Texts we learn about the Ancestors, the original divine dwellers of the Field of Reeds. The Ancestors were responsible for bringing into existence all that exists. This belief that all emerged from water is highly significant and was validated by modern science in 2005. New results from a particle collider suggest that the universe behaved like a liquid in its earliest moments, as opposed to the fiery gas long thought to have characterized the first microseconds of existence. How did the Egyptians know this? Probably through visionary experiences walking the stars. Scientists now think the universe was initially a thick, hot soup that trapped light. About 350,000 years after the Big Bang — the theoretical beginning of it All some 13.7 billion years ago — things cleared and an imprint of the earlier conditions was left on the entire cosmos. Scientists previously detected this imprint as the Cosmic Microwave Background. This ‘Field’ is everywhere in the sky and packs important clues about the structure of the nascent universe. Something similar should have happened with sound, according to Daniel Eisenstein of the University of Arizona. The early universe, he proposes, rang with the sound of countless cosmic bells, which filled the primordial darkness with ripples like the surface of a pond pounded by stones. The wave fronts later served as spawning grounds for galaxies, his research reveals. Returning to Edfu, we learn that in the Island of the Egg was found a High Hill (which sounds like a place where extra matter piled up). It was on the high hill that a group of nameless deities who existed before the origin of the world came into manifestation. Reymond notes that these divine creator beings seem to have lived in the Island of the Egg in an insubstantial form. These shapeless creative powers were described by the Egyptians as the Most Aged Ones and the Lords of the Light. They begat themselves, says Reymond, without father and mother. A similar description is given to the biblical king Melchizedek, the priest-king of Salem who was born without mother or father and who performed the first manna and wine ceremony. Clearly, we are asked to believe that the first creator beings were immaculately conceived from ‘out of the blue’ ala Ptah. The Lords of Light were regarded as self-created divine beings and are described as the Primaeval Ones. They are the star children of the Ancestors. To me self-conception is the same as self-replication. The Island of the Egg sounds like an A.I. replicator space bird / ship… or a creation or genesis egg laid by one. According to Reymond’s interpretation of the Edfu Texts, these formless beings shaped their solid, physical bodies out of a substance produced by the fertilization of bnnt. While it is not certain exactly what the Egyptians were talking about, Reymond speculates that the term bnnt seems to describe the place in which the mystic union between the Primaeval Ones and the cosmic waters of Nun occurred. She hints that the newborn Earth might have been imagined as an island or embryo of bnnt which emerged from the waters of Nun – the Island of the Egg. This line of thought suggests to me that the island of Earth is a place where two streams of water meet, the lower (Earthly) waters and the upper (heavenly) waters. These two ‘life streams’ will be discussed again momentarily. Apparently these beings were thought to have acted first in somewhat insubstantial form while creating the Island of the Egg. After the ‘substance’ was brought into existence by the fertilization of the bnnt-matter, and had its manifestation in the emergence of the island, then it was possible for the primaeval powers, the original creators, to undergo metamorphosis and assume a physical form. In my A.I. scheme, the beings self-replicated themselves from nano bots. As an alternative, I’m thinking they may even have entered into human bodies they created by a divine power. I am highly intrigued by the Edfu re-collections and re-memberings concerning the Primaveal Ones. Particularly since Ancient American oral tradition from Tennessee, where I live, retold by Cherokee wisdom keeper Dhyani Ywahoo says that formless “thought beings” called TLA beings rode a sound wave from the Pleiades star cluster through a hole in space in East Tennessee and created the Cherokee. All humans are dream children of these angels or elemental forces who came from the stars. The Egyptians imagined that, after the first phases of creation were completed, the Primaeval Ones lived in the vicinity of a pool that contained a lotus and within it the Sun-God. Reymond says this pool was undoubtedly a reed pool standing on the marginal land of the island. The Edfu evidence describes it only as an area (the edge?) of reeds. It bears the name elevated seat of the god.13 This seat is pictured as a dd pillar that was made of reeds. Reymond hypothesizes this represented the actual spot or nucleus of creation – the place where the divine powers fertilized the bnnt-matter, the ‘embryo of the Earth’. The name of the god who sat on this perch the midst of this field of reeds was PN, This One. Interestingly, in Greek myth Pan invented the reed pipe. Pneuma is another word for the Holy Spirit. Two symbols are mentioned in connection to this being ‘PN’, the Member of the Progenitor and the Image of the Arm. These might have been actual objects or technologies used by these beings in the creation of the island of Earth. In between the stages of creation or ‘genesis’ – first the creation of the primary matter of the Earth and then the shaping of this matter – it appears these technologies remained on site. Another epithet of this ‘PN’ god, the overlord of the dd-pillar, indicates that This One might have been the ruler of the Field of Reeds. This divine being can be imagined as resting on the dd-pillar (Djed) of reed in the midst of the pool (of the waters of creation), just like the Sun-God on the lotus in the Egyptian creation tale from Heliopolis. The Egyptians definitely imagined this as an actual spot or dot of real estate. This dd-pillar of reed was protected by (or balanced by?) two other entities described as the Htr-hr, and yet another falcon named Nfr-hr, who was referred to as the Sanctified Ruler and the Ruler of the Wing. The name Htr-hr is given to a divine being that dwelt in the dd- pillar of reed. Reymond supposed it was possible that Htr-hr (later Heter-hor or Hathor) functioned as a protector. In fact, the Htr-hr is interpreted as a deity who repulses the evil-doer from the Mansion of God. What we deduce from this astounding mythology is the idea that the Field of Reeds was located in a primaeval island where two symbols or technologies were found that represented immense, but unspecified, creative powers. It was here that the world began and where formless entities, creator beings, lived. In her analysis of the Edfu genesis tale Reymond proposes there is clear evidence that during the first phase of creation the island of Earth was first occupied by divine beings from the Field of the Blessed. Then, a second group of beings appears. These mysterious beings were led by a group of individuals known as the drty-falcons or Sages. Among these new inhabitants is a mysterious figure named the Falcon, who is known as the ‘Lord of the Perch’ and ‘The Winged One’. He leads a group called the ‘crew of the Falcon’ – referred to as the Eldest Ones. …a single Djed pillar located in the Field of Reeds (Aaru) and resurrect the Homeland. Reymond proposes that the Field of Reeds assumed a new function when the second period of existence of the island dawned; it became an Ancestral Territory. The name, Ancestors, can, in this tradition, only apply to the original divine dwellers of the Field of Reeds, she notes. This description rings of the Hebrew ideal of the lost Eden. The Edfu Texts tell us the Falcons or Sages built the Great Seat or Temple of the Falcon. When this temple is threatened by rising waters, the Falcons are instructed to enter the enigmatic place called Place-in-which-the-things-of-the-Earth-were-filled-with-power’, another name for a water-encircled island. Here, they conduct spells, which make the waters recede. To do so they used power tools, named iht, ‘relics’, which are stored within the island/egg. In my A.I. scheme these relics can be interpreted as advanced nano-technology creation devices. The Edfu Texts tell us that gradually the divine Sages are replaced by the Shemsu-Hor, the predynastic ancestors of the Egyptians led by Horus. The Royal Papyrus of Turin (written during the time of Ramses II) records that the reign of the Shemsu- hor stretches to remote antiquity (up to a fantastic 40,000 years). These kings lists call the Shemsu-Hor Akhu, meaning ‘Transfigured Spirits’. Akhu or Ax-hu is the plural of akh or ‘light’, inferring that the Shemsu-Hor were also thought of as light beings. These are replaced by the Horus kings at the time of the First Dynasty in c. 3100 B.C. Robert Bauval speculates that the Shemsu-Hor were ‘a lineage of real (and)… immensely powerful and enlightened individuals’, masters of the science of astronomy, whose purpose was ‘to bring fruition to a great cosmic blueprint’. It is explained that the Falcon had arrived there after, alighted on the Perch and was uplifted by the reed. Through the power of the reed Perch the gods were uplifted and the dead or dark world was brought into light. It is clear that the Dd-pillar had the power of resurrection. It could resurrect the gods and resurrect the Field of the Blessed. After the new divine being alighted upon it, the ancestral Falcons were awakened from their slumber. They returned to the place where they formerly ruled in their spiritual forms. Reymond believes this Perch was the mechanism through which the island could be brought to new life and returned to its original blessed state. “The Perch was believed to impart sanctity to its nearest surroundings,” she concludes. My read is that it made the island ‘reedy’ again. In other words, it created a sanctuary of life, the Field of Reeds. Once again, the Edfu texts describe some form of terraforming or restorative technology that can easily be seen as a nano-technology device. The narrative makes clear that the ancestral deities came from the Field of Reeds and created an Earthly field of reeds as a new home. Their successor, the Falcon, also lived in this field. When the first field of reeds vanished power relics that became the Perch of the Falcon were recovered. This Perch renewed the connection with the Field of Reeds. We can imagine this Perch or pillar standing in the center of the Field of Reeds receiving and beaming blessed energy. It is linked to the original domain (dimension) of the Ancestors. It created a sacred or sanctified space by bringing out substances hidden beneath the waters of Nun. From this vantage point the Perch takes on the feel of either an antenna beaming divine powers or vibrations from the other-dimensional Field of the Blessed or genesis device like a von Neumann machine. Do the Edfu Texts chronicle the arrival of astrochicken type seeder ships? The parallels between the ancient Egyptian story and modern science (fiction) are certainly worthy of serious consideration. Join Clare and I for further exploration of these remarkable texts during our Sacred Egypt tour, March 11-25, 2019.